It’s the dog days of summer and fruit is falling from the trees. Literally. After an early morning run my buddy brought me into her yard where her peach and fig trees were exploding with fruit. We picked until the box was full. When I got home I wasn’t sure what to do with all of it, but I came up with this. In a heated grill, place the peaches on a grill pan cut side down. Allow them to grill for 8-10 minutes depending on the heat of the grill. Be careful, as you still want them to be slightly firm and maneuverable. If they grill too long they will get too soft to handle. 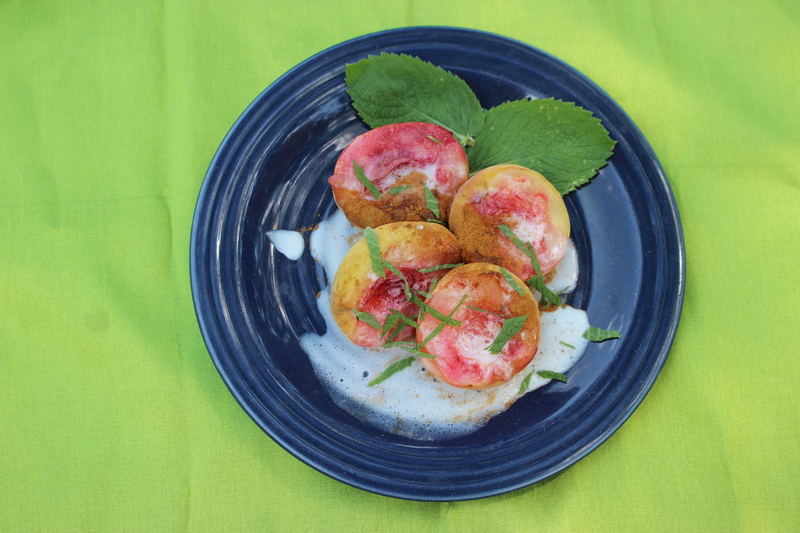 Pull them off of the grill and place the fruit cut side up on a plate; then drizzle the peaches with coconut cream and cinnamon. Sprinkle walnuts all over the plate. With kitchen shears cut the mint leave into ribbons and place them on top of the peaches. The warmth along with coconut cream enhances the natural sweetness of the peaches making it a delictable grilling fruit. What kind of grilled fruit do you enjoy?